Also endorsed by Families of Sisters In Spirit. The families of people killed by the police, their friends and their allies are organizing the third annual commemorative vigil to remember those who have lost their lives at the hands of the police. These families, who face an uphill battle in uncovering the truth and obtaining justice for their loved ones, need our support. Monday, October 22: There will be a family-led and family-friendly vigil in front of the Police Brotherhood (480 Gilford St., Laurier metro, St-Joseph exit). We strongly encourage as many supporters as possible to come out and show our support for the families. There is power in numbers! What we are seeking is DIGNITY, JUSTICE and TRUTH. SUPPORT their families in any way we can. The Justice for the Victims of Police Killings Coalition currently involves the family members and friends of Anas Bennis, Claudio Castagnetta, Ben Matson, Quilem Registre, Gladys Tolley and Fredy Villanueva, all of whom died as a direct result of police actions and interventions. We continue to reach out to family and friends of other victims of police killings. This initiative came out of the Forum Against Police Violence and Impunity in 2010, during which the families expressed their desire to come together to remember their loved ones and strengthen their respective struggles for dignity, justice and the truth. 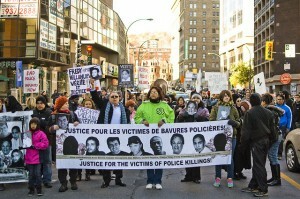 The symbolic date of October 22 was subsequently chosen for a family-friendly event to commemorate the victims of police killings to coincide with the National Day of Protest in the United States organized by the October 22nd Coalition to Stop Police Brutality, Repression and the Criminalization of a Generation, which has been mobilizing every year since 1996. In Montreal, there have been more than 60 people killed by the Montreal police since 1987. This includes the more recent killings of Mario Hamel and Patrick Limoges (June 7, 2011), Farshad Mohammadi (January 6, 2012) and Jean-François Nadreau (February 16, 2012). Join us in denouncing these and all the other examples of police violence and impunity. We ask for your group’s endorsement of our demonstration. To endorse or to get involved contact us at (514) 848-7583 or at 22oct.mtl@gmail.com. You can pick up flyers and posters for the event at QPIRG Concordia (1500 de Maisonneuve St. W 2nd floor).